Between March till December there are charter flights to Kalamata Airport (approx 40 minutes drive to Gialova Gardens) from Holland, Germany, England, Austria, Sweden. Year round daily scheduled flights from most countries to Athens airport (3 hours drive to Gialova Gardens). If you are driving your own car there are daily ferry-boat departures from Italy (Venice, Ancona, Bari, Brindisi) to Greece arriving in the harbor of Patras (two hour drive to Gialova Gardens). Gialova is a small coastal village, 7 km from the town of Pylos, which is located in the Peloponnesian province of Messinia. 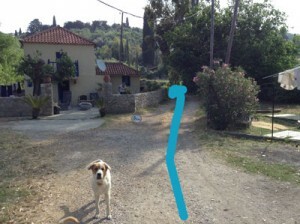 The distance to Athens is approximately 300 km. The distance to the city of Kalamata, which has an airport, is 45 km. The distance to the port of Patras is about 200 km. Most major archeological sites, e.g. Epidavros, Vasses, Olympia, Mycenae and Mystras are within easy reach for day-trips. 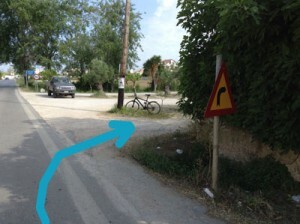 From Kalamata you follow the signs to Pylos. 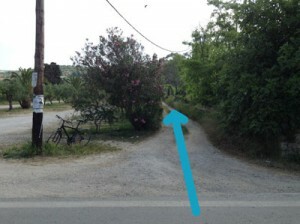 About 5 km before Pylos, you read the sign that tells you Γιαλοβα (Giálova) turn to the right. You drive downwards, with at your left hand side the Navarino Bay Golf Course. Please continue your way for about 3 km till your recognise the pictures shown below. Our (off) road entrance street is next to the first parking area of Giálova. 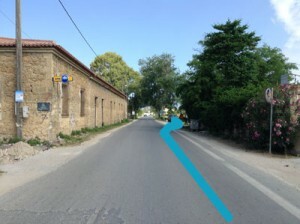 The three identical bungalows, the Mykanos style villa and the villa with the Toscany look are located just behind one of the main parking areas of the Giálova Boulevard. 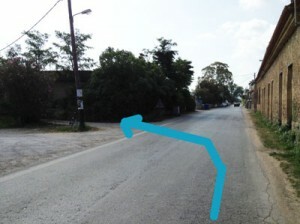 As there are no signs, the following pictures give you an indication which (off) road ‘street’ you have to take to get to your accommodation. Also we have GPS coordinates for you: 36.951339 21.705767 (N 36 57,080 E 21 42,346). If you come from the north, just after the second parking area and opposite the museum, you find the road that leads to Gialova Gardens.